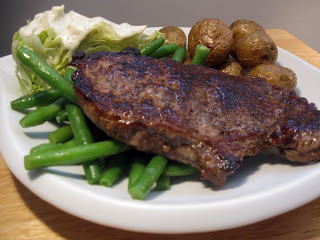 With green beans and an iceberg wedge covered in blue cheese dressing. The steak was done in a cast iron pan with lots of pepper, bit of salt, bit of butter. Wonderful! 1. Take your steaks at room temperature, and generously sprinkle both sides with salt and pepper. This seasoning is gonna help to form a crust on the steak. Fry the steak in a hot cast iron pan to get a good sear. After you flip the steak you can put some butter on top of the steak. This will help it from sticking to the pan, and help it cook, and give it more flavour. 2. Use a meat thermometer, or touch the steak. When you start to feel less give when you press down into the steak it means it's a little cooked through. I would recommend medium rare myself. If you want it well done (which some crazy people do), if you push down and find little give its cooked through. 1. Roast potatoes in the oven with salt, pepper, and a little oil for 20 minutes at 400 degrees F.
1. Steam some green beans and blanch them in ice water to stop the cooking process. This will keep them from getting overcooked and keep their bright green colour. Then toss them in some melted butter. 1. Cut a wedge of iceberg lettuce. About 1/4 of a head of lettuce. Mix mayonnaise, vinegar, crumbled blue cheese, salt, and pepper together for a dressing. Drizzle on top of the wedge.